Mother of pearl, or nacre, is found lining the insides of certain mollusk shells such as oysters and it has been used as inlay material for centuries and across cultures to embellish furniture, musical instruments, and other objects, as well as jewelry of course. A combination of mineral and organic substances, mother of pearl is created as multiple layers of very brittle aragonite (a form of calcium carbonate) with conchiolin, a flexible protein secreted by the mollusk that is similar to silk. The result is a resilient and flexible material that can withstand hard use though it remains soft, which makes it is easy to cut and carve, but also leaves it susceptible to scratching and other damage. Mother of pearl inlay has long been used on mantel clocks, as can be seen on some Louis XIV mantel clocks, says Mikael Kraemer of the Parisian Kraemer Gallery, which specializes in 18th century furniture. Such clocks occasionally appear at auction such as in 2012 when a red tortoiseshell, mother of pearl, brass and pewter marquetry mantel clock, dating from Louis XIV sold for €8,750 ($11,225) at Sotheby’s Paris, while last year a Dutch gold pocket watch made for the English market, circa 1720, set with gems and mother of pearl sold for $21,250 at Sotheby’s New York. In the 1920s, Cartier also regularly used mother of pearl sometimes etching it with black enamel or offsetting it with onyx, to create the geometric motifs of its Art Deco mantel clocks. The iridescent material became fashionable on watch dials for “a very short period” in the early 20th Century, “however mostly with watches that have no horological interest. These were fashion items of the time,” says William Rohr, consulting specialist for Fine Watches at Bonhams. While watchmakers continued to occasionally use mother of pearl on dials, it was mainly in rather plain fashion for example as a thin round slice for the entire dial or occasionally with traditional sunray motifs. But in recent years, the material has enjoyed a renaissance with artisans elevating its use to new heights through different decorative techniques. 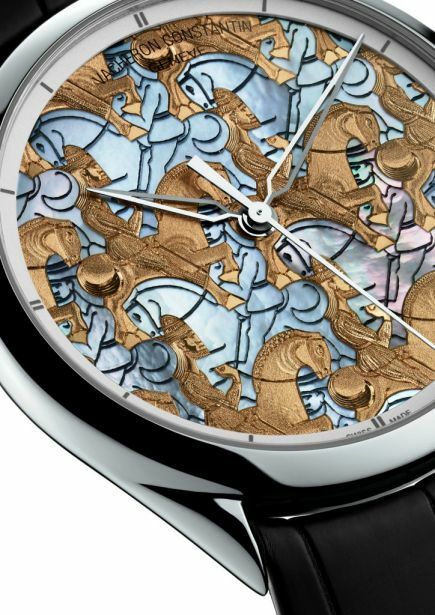 For its Métiers d’Art Les Univers Infinis collection in 2012, Vacheron Constantin’s craftsmen used the art of marquetry, which dates back to the Egyptians, to assemble a pattern of proud Ottoman horsemen crafted in gold and mother-of-pearl, further engraved to hollow out details. That same year, Cartier unveiled a large model Tortue watch with a cockatoo motif with plumage fashioned from engraved mother of pearl slivers juxtaposed against a crest and beak realized in colorful champlevé enamel, while Girard-Perregaux created a timepiece in mother of pearl marquetry that paid homage to Le Corbusier by reproducing an early geometric bas-relief by the pioneer of modern architecture and design. This year, Harry Winston used a marquetry of different types of mother of pearl in a soft pastel palette (freshwater, Tahitian, solid pink, white, and beaded mother of pearl further enhanced by brilliant-cut diamonds) for the Art Deco-inspired geometric motif of an Avenue C timepiece, while Boucheron unveiled a Fleur du Jour timepiece with gray mother of pearl petals on a bed of diamonds angled to catch the light and further enhance the relief. Dior has also expanded its Grand Soir collection with five one-of-a-kind timepieces inspired by origami, the delicate Japanese art of paper folding, using mother of pearl marquetry of various triangle shapes to create a subtle optical effect further enhanced by triangle- or trapezium-cut precious stones, while Chanel offered Mademoiselle Privé Coromandel timepieces with a dial featuring Chinese musicians beautifully carved out of mother of pearl. The creation of these stunning dials starts with the careful selection of the best natural material, which is then finely polished to obtain a perfectly flat surface. According to Gerard Chapuis, commercial director of Swiss dial maker GT Cadrans SA, top-quality mother of pearl is found in the shells of the Australian Pteria margaritifera mollusc, which are particularly sought-after as they are extra-white. Another excellent source, though different from Pteria margaritigera, says Chapuis, comes from the atrina vexilum found in Vietnam, a mollusk characterized by its elongated, wedge-shape shell. “That nacre is often tinted or sprayed, lacquered as naturally dark coloured, to create all types of colors. The shine is different though,” Chapuis says. “The way GT Cadrans works is really very artisanal. We do not buy pre-cut mother of pearl. Instead, we buy the shells, select what we want to use and then cut it ourselves. For high-end brands, like Girard-Perregaux, we will only use 15 percent of the shells, focusing on the extra-white color material,” Chapuis explains. 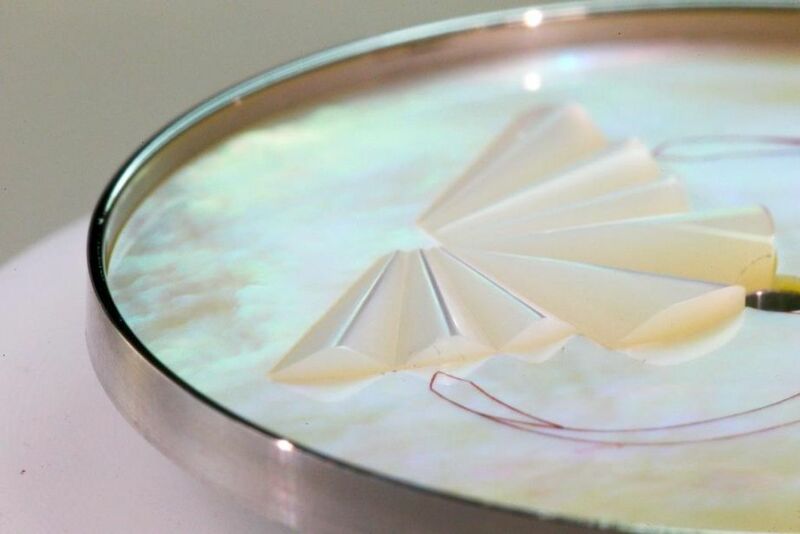 More recent use of elaborate marquetry techniques with nacre reflects the development of technologies, like CNC (Computer Numerical Control) machines that allow for the precise cutting of paper-thin mother of pearl. 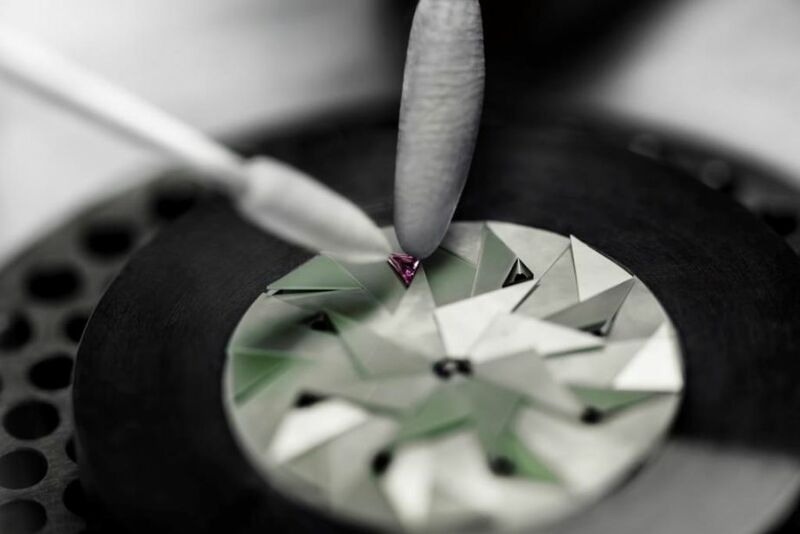 “It’s not unusual that the slice must be only 0.2 millimeters, so you must be really precise,” Chapuis explains, adding that painstaking attention has to be taken at every step of the production of the dial as mother of pearl can become brittle if not handled gently. Chapuis says the most complicated dial can take up to six weeks to realize. Beyond marquetry, watchmakers have also sought to enhance mother of pearl dials with miniature painting. Van Cleef & Arpels has reached out to Isabelle Villa for some of its Extraordinary Dials collection, where she has rendered miniatures with great subtlety creating a range of nuance and detail thanks to the use of a binocular magnifying glass. Reproducing the original drawing freehand, the artist gradually builds the composition by applying successive coats of paint, each requiring individual firing for one hour at 80°C. For added difficulty, Van Cleef combined the technique with mother of pearl sculpting. “Painting on a relief motif is not easy as you have to apply the paint in every single corner of the dial — sometimes angular — without damaging the rest of the work yet finalized and without excesses of paint. You also have to grasp the relief in order to bear in mind the direction of the light on the painting,” explains Villa. The result though is a dazzling coming together of the natural and the man-made.